The pedigree highlight of Charles Martin Smith’s career so far was directing Air Bud, the story of a basketball playing golden retriever. So how did he come to be directing a film about the Scottish National Party? Stone of Destiny is a feature film from Canada, the first country to address the subject of modern Scottish nationalism. There’s some history here; Braveheart and Rob Roy both positioned Scots as rugged heroes and the English as snivelling villains, and audiences worldwide took this vision to their hearts. Smith’s film comes closer to the present day, depicting the SNP supporters who removed the stone of destiny from Westminster Abbey in 1950, and brought it back to Scotland, as heroes of reclaimed nationhood. Stone of Destiny’s central character is closely based on SNP activist Ian Hamilton, who also acted as advisor on the film. The on-screen Hamilton is played by a dapper Englishman called Charlie Cox, his girlfriend by New York’s Kate Mara. With Canadian Smith writing and directing, a few Scots loiter on the sidelines, Steven McCole as a strongman, Robert Carlyle as Hamilton’s mentor, and Billy Boyd and Peter Mullan as his best pal and dad respectively. But shouldn’t a film about Scottish nationalism star a Scotsman? Casting non-Scots as Scots is neither a crime nor a novelty. Bonnie Prince Charlie was played as a perfect English gentleman by David Niven. The Highlander aka Connor MacLeod didn’t come from the little town on Glenfinnan; Christophe Lambert was born in Long Island. Just because Stone of Destiny’s hero isn’t played by a Scot, it doesn’t mean the film’s crap but it gives a clue as to the blandness. Featuring yet another small community rallying around an individual with an unusual dream, The Stone of Destiny takes its place amongst a run of government-funded identikit features including Born Romantic, Blow Dry, Grow Your Own, and Lucky Break, with Scotland’s entries in an overcrowded field including The Rocket Post, On A Clear Day, and The Flying Scotsman. Despite the success of full-blooded Hollywood visions of Scottish history in Braveheart and Rob Roy, historical, political or socially relevant subjects have not been tackled. Which is how Smith’s film got made, an old-fashioned caper film portraying Scots as bumbling oafs and ruddy faced idiots, dancing like loons in George Square on Christmas Day to celebrate the return of a chunk of rock. Earlier this year Scots saw the boozed-up swilling cannibals of zombified Glasgow portrayed in Neil Marshall’s Doomsday. Not since Ardal O’Hanlon adopted a ‘See You Jimmy’ hat as Coconut Tam in 2005’s Greyfriars Bobby have such crude, backward images of Scots been seen. With the cost of low-to-medium budget filmmaking cheaper than ever, and with the commercial mindset of the new Creative Scotland body currently under discussion, the very existence of Stone of Destiny begs the question; why can’t Scots tell their own stories onscreen? 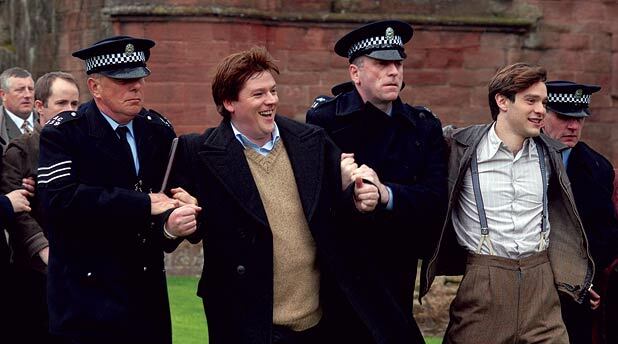 Smith's hysterical, historical heist film gets a Scotland-only release. Cox plays Ian Hamilton, a student who sets out to liberate the Stone of Destiny from Westminster Abbey and bring in back to Scotland. A cinematic non-event, devoid of thrills, excitement and even common sense.